What was the experience for St Ives during one of the most cataclysmic events ever to effect Great Britain? Certainly there were changes to the town. Many of our men marched off to life changing experiences. Some never returned. For those left behind, there was a strange mix of mundane ongoing routine and earth-shattering news. The map below shows there was no escape from fatalities. Each red dot represents a wife or parents of the eighty-eight names of brave men who gave their lives and whose stories are recorded below. If you hadn't suffered a loss yourself, you certainly knew many who had. Read on for details of the effect of World War I on St Ives and its people. Under the section on the St Ives War Memorial are links to the personal stories behind every one of the brave men listed who gave their lives. And read of those St Ives men who gave their lives but are not listed on the War Memorial. In 1914 the only means of obtaining news was by word of mouth, letters and newspapers. War was declared on Tuesday 4 August 1914. First mention in the local newspaper, the Hunts Post, was in the following edition on Friday 7 August 1914. The war must have come as a great shock to most St Ives residents. Once war was declared, the town certainly didn't hang around. The day after the declaration the Mayor invited all the young men of the town to a meeting in the Corn Exchange to ensure there were enough Red Cross volunteers. Prices immediately increased and the banks closed for a short period. The Hunts Post was full of more news of the war, from hints for housewives to first news of the recruitment campaign. In just eight weeks, 750,000 young men from around the country joined up to go to war. In every town and city training camps were established. Within three weeks of war being declared, St Ives was preparing to billet soldiers for one of those camps. 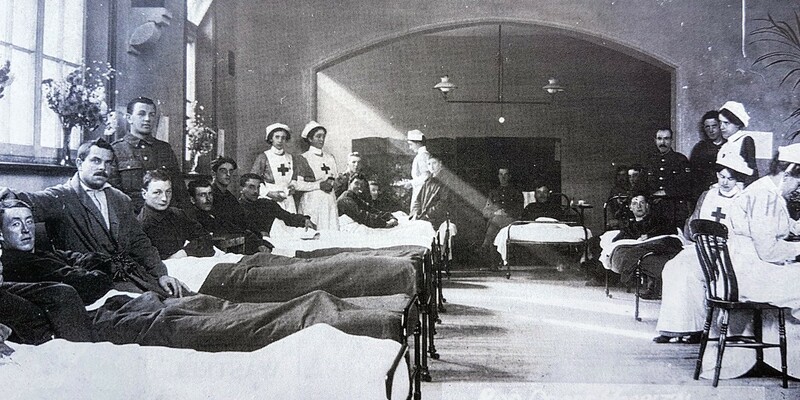 A Red Cross Hospital was set up ready to take wounded soldiers, the first in the country to receive recognition from the War Office. Public buildings such as the Corn Exchange and the cattle market were requisitioned by the Army. By the beginning of September 1914 soldiers arrived in the town. Leisure facilities were prepared for them. Pubs closed earlier, at 9.30pm. Military sentries were posted around town and motorists, cyclists and pedestrians were warned if they failed to stop when challenged they would be fired upon. Hemingford Meadow became a training ground, the exercises attracting large crowds of spectators. As suddenly as soldiers under training moved into town, they were back on the move to unknown destinations. Rumours abounded, such as the tale of a local German spy. Having sent heads of households a form to list resident young men, they soon received their call-up. The first meeting to recruit young St Ivians was held mid September. The Hunts Post published hints for soldiers bound for the Front. The White Feather Association sought to shame St Ives men into enrolling. The Hunts Post published cartoons aimed at those young men, even targeting fathers of young children. An advert was published for the Bantam Battalion, reducing the minimum height of recruits to 5ft. The Hunts Post published the first chilling figures on wounded and dead. Local volunteers were on constant guard around the town. But life continued. Broncho Bill's circus performed in Hemingford Meadow. The Town Council met weekly, the Workhouse Guardians fortnightly. In the local court a procession of townspeople had cases heard. Such news as the first use of gas by Germans was a particular concern for worried families. It wasn't long before the first wounded local man returned. Then news of the first St Ivian killed at Front. An unexpected knock on the door was feared by those families with men serving. The graph below shows how news of death by telegram became a regular event. The first letter was published telling of experiences in the trenches. There were extraordinary examples of sacrifice. The Hurl family of The Waits had 5 sons serving. Later, their photographs were published. The Kiddle family had father and four sons serving. The Hunts Post printed a list of St Ives men serving. Some local recruits had a very positive experience of Army life. A daily serving of meat was a rare luxury in the early 20th century. Add to that supplies of cigarettes and rum and the adventure of foreign travel such as in Egypt. But for many there were nightmare experiences. The drip feed of casualties and deaths continued, Private George Hammond's being the first photo to be published of a St Ivian killed, followed by that of Sergeant Bert Attwood. The town saw a series of military funerals, the largest being for Lieutenant Dennis Ivor Day, son of the Town Clerk and one of two Day brothers to lose their lives in WWI. And then first news of deaths from major battle disasters came through, with the death of Private Thomas Allen at Gallipoli. His widow and two young sons were left to mourn his loss. Later, local lad Trooper Ben Corbett wrote of his experiences in Gallipoli. 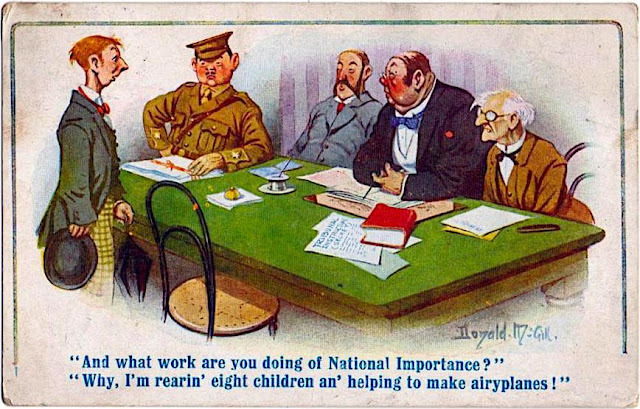 Conscription was introduced early in 1916. The above image makes fun of a local Military Tribunal, but the weekly hearings were serious affairs, judging on appeals against being called up from occupation or personal circumstances. In the second half of 1916 there was positive news of the Battle of the Somme. Then came the weekly news of St Ives men injured or killed. By Feb 1917 France were preparing for victory. Increased German submarine activity caused food shortages and rationing followed. With the Battle of Arras from spring 1917 onwards, more deaths and casualties featured in the local news. Sober figures were published of dead and injured. Another surge in deaths followed Passchendaele. The graph below shows the War was no respecter of age. Ten St Ives teenagers died. The oldest St Ivian to die was aged 43yrs. The year started ominously in 1918 with Germany's Spring Offensive, when half a million extra enemy soldiers were transferred to fight in France. By August the German offensive was exhausted. The Allies started the Hundred Days Offensive, the final battle that ended WWI. Even in the final stages of victory, St Ives men continued to give their lives. Some died within days of the Armistice being declared, the War ending on 11 November 1918. In February 1918 the Lord Lieutenant asked Town and Parish Councils to maintain a record of those who had served in WWI. It was reported on 22 March 1918 that the Mayor's proposal to use a committee to carry out a systematic house to house canvass was accepted. The Roll of Honour was completed in 1919, listing 397 St Ives men who served in and survived WWI. It lists groups of families who went off to war and returned home, fathers and sons, uncles and cousins. Also listed are the 15 men who returned with medals awarded for bravery or distinguished conduct. What isn't detailed are those who returned with physical or mental injuries and how they fared. St Ives, along with all the towns and villages in the county, celebrated the end of war. It was many months before all the serving soldiers returned home, men changed by their experiences of war. To read newspaper cuttings about St Ives and its residents click here. To get weekly news of St Ives 100 years ago click here and like the Facebook page. There are a number of tributes around the town to local men who gave their lives during World War I. A plaque in the Methodist Church commemorates 16 members of the congregation who died in WWI. There's a similar memorial to members in the Literary Institute. The most obvious is St Ives War Memorial, located in the Market Hill, erected on 11 November 1920. 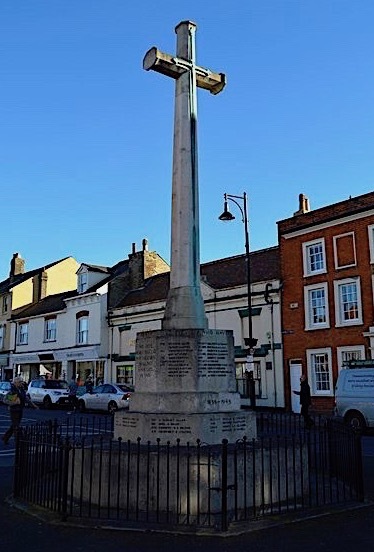 Created in the image of the Cross of Sacrifice designed by Reginald Blomfield, it features an elongated cross with bronze longsword pointing downwards. Made of limestone, a close look reveals hundreds of tiny fossils on its surface. There are more than a thousand similar memorials in Commonwealth war cemeteries across France, Belgium and throughout world, generally where there are more than forty graves present. Many memorials in Great Britain also used Blomfield's design. The following words are inscribed on the St Ives War Memorial plinth. The Monument shows 74 names of those killed in WWI. Below are listed all those names. Click any entry to read the personal story behind the name. Of the 74 names, 32 have no known grave. Why so many? There are a variety of reasons. Thousands of small burial plots were created on or very close behind the battlefields. Although registered, in 1918 many were over-run first by the German advance and later by the Allies pushing East again. This resulted in uncertainty about their exact locations. Additionally, plots were destroyed by shelling. Sometimes bodies were not found. If killed during an assault the soldier might lie in no man's land for some considerable time, increasing the chances of burial by shellfire. And a direct hit by a shell would leave very little evidence, the unfortunate soldier being blown to pieces. There are also St Ives men who gave their lives and are not listed on the War Memorial. They are nevertheless included in a separate list below. A number of the missing men lived over St Ives bridge, in Bridge Terrace or Filberts Walk. These men worked and shopped in St Ives. Their friends were from St Ives. Almost all listed their place of birth as St Ives on the census forms. Both locations are generally considered part of St Ives. Yet these St Ives men are commemorated elsewhere. Through a quirk of local parish boundaries Bridge Terrace is part of Fenstanton, Filberts Walk part of Hemingford Grey. 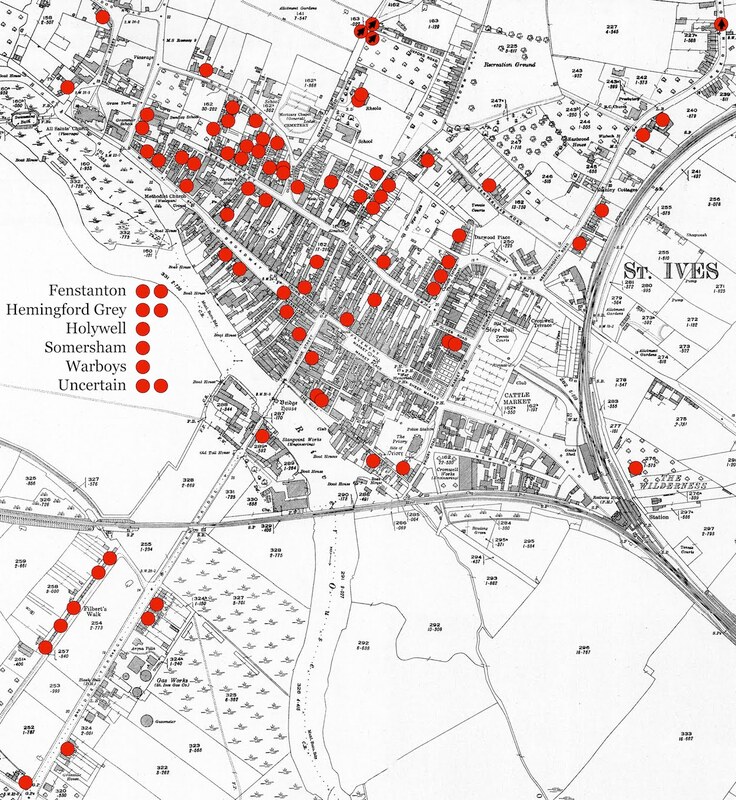 Men from these addresses are commemorated on the war memorials for these villages. It appears some names of St Ives men were just missed from the memorial. Maybe the families were too traumatised to ensure their names were included. Possibly they didn't want the names publicly displayed. In the life stories, no special mention is made when men were awarded the Star Medal, British War Medal and Victory Medal. Never awarded singly, these medals were issued to all British officers and men who served in any theatre of war during WWI. Some of the entries include a photograph of the person named, but most do not. If you are able to supply a photo or any additional information, please get in touch via the make contact page.